This is not the most appealing food photo you have ever seen. Black, orange, and green are not automatically what comes to mind when you think of something you want to put your fork into. BUT, hear me out, because these rice bowls are delicious, and they have all.the.healthy.things. 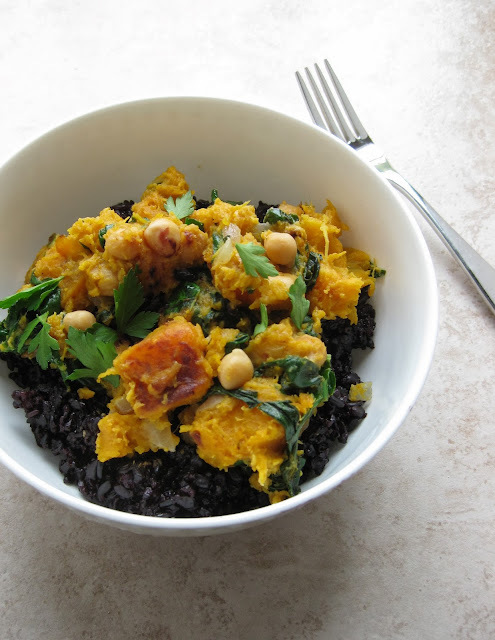 Black rice (antioxidants), butternut squash (vitamins), chickpeas (protein & fiber), spinach (iron), and tahini (healthy omega-3 fatty acids). If you're still thinking this sounds healthy but is not necessarily something you're dying to eat for dinner, let me just make one last pitch and say that the tahini/lemon/garlic sauce binds everything together into one comforting, filling, yummy dish. I needed this comforting rice bowl today because it has been one of those weeks. One of those weeks when you feel like nothing you're doing is ever enough. When I get stressed and have a lot of work to do, I tend to eat not-so-healthy things, which sends me into a further spiral of feeling bad about myself in general, which culminates in a big angry stress ball of angst. No good. Thus, I'm making a concerted effort during the next month to make big batches of healthy, comforting foods that will fill me up without leaving me feeling gross. These rice bowls fit the bill perfectly. I'm also super thankful to have the best man around to keep me grounded and happy. My angsty stress-filled moments usually happen when he's gone. He was in Charlotte this week working and had received some pretty pitiful texts from me. Without telling me, he left work four hours early on Thursday and picked up pad thai from our favorite Thai place to surprise me when I got home. Then I fell asleep on his chest and left a big drool spot on his shirt. Hope you have a lovely evening, friends. Arrange butternut squash on a large cookie sheet. Sprinkle with 1 tablespoon garlic, allspice, and salt & pepper. Drizzle with 2 tablespoons olive oil and use your hand to coat the piece evenly with oil and spices. Roast for 20 minutes or until slightly browned and soft, stirring halfway through to prevent burning. In a large skillet, heat 1 tablespoon olive oil. Add diced onions and cook for 5 minutes or so until slightly translucent. Add chickpeas and cook for 5 additional minutes. Add squash and spinach, cooking just until spinach is just wilted. Pour in tahini sauce and heat until warm. Serve over rice and top with fresh parsley. 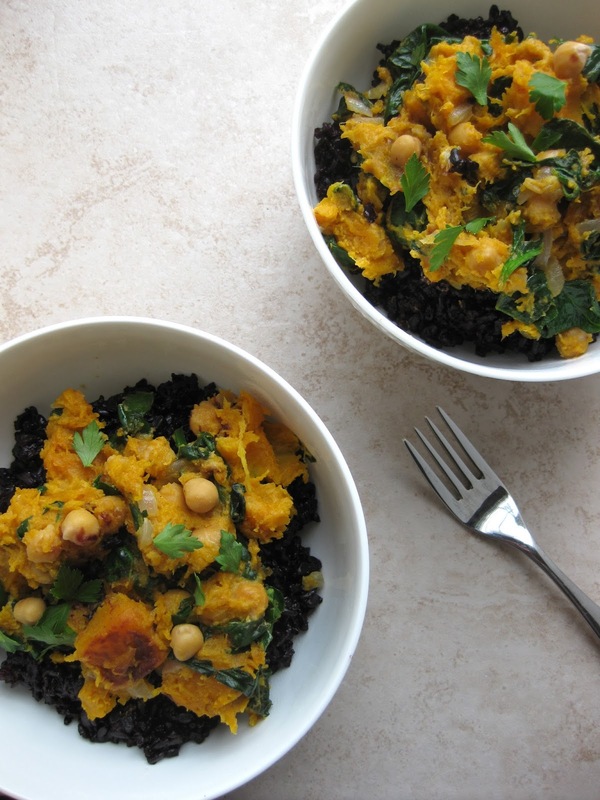 Adapted from Smitten Kitchen's warm butternut squash and chickpea salad. I think they look tasty! 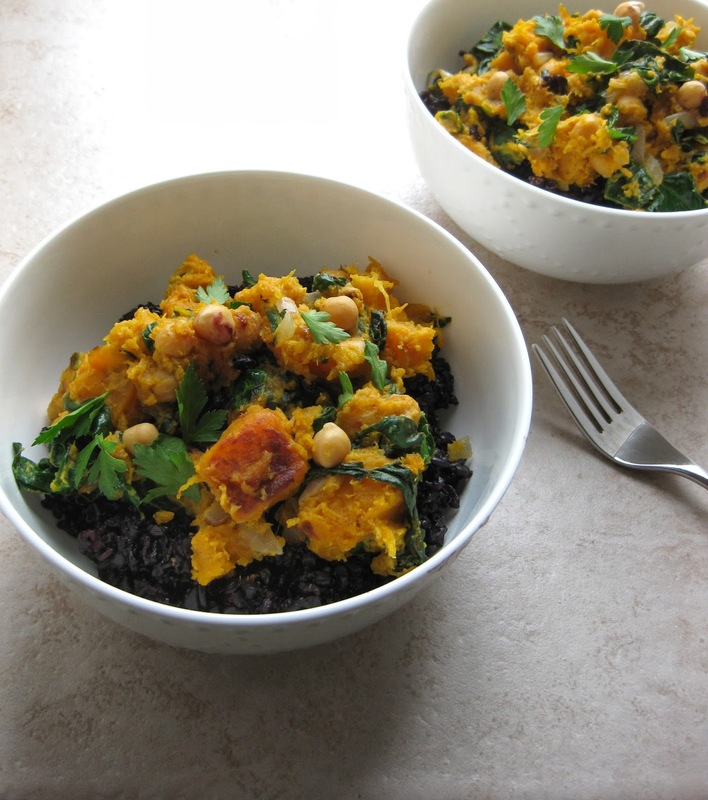 Butternut squash and greens pair very nicely together. Well it certainLy looks and sounds appealing to me! II think you and I have had the same sort of week! Blah! Thanks guys! Glad someone else appreciates the squash and chickpea goodness! This is one of my favorite recipes!! I make it at least once a year. Yum. And yes, our boys ARE lucky to have us drooling on their chests while sleeping!